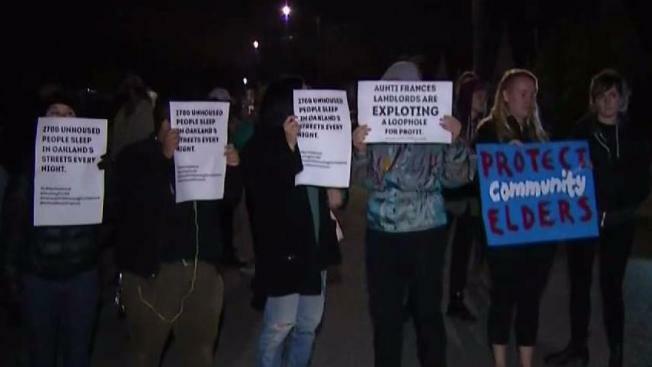 Activists camped outside of Oakland Mayor Libby Schaaf's front yard on Saturday night to push the city to provide more housing for homeless people. According to reports on social media, the camp-out is a part of the 96 hours of direct action to demand housing. In a Facebook Live by the Anti Police-Terror Project, activist Cat Brooks showcased several other activists in tents and with many signs in peaceful protest. Twitter user Matt Leonard said that the camp-out comes as a response to Mayor Schaff publicly asking the community to offer their homes in response to the housing crisis. "Not only should she be first in line, she needs to lead with real policies to solve this," said Twitter user Matt Leonard. Brooks also said that Mayor Schaaf’s husband did come out to see what was going on in their front yard, but the mayor herself did not. In a statement released by the Anti-Police Terror Project, the organization demanded several things from Mayor Schaaf, including that she "take her own advice and commit to offer space in her home to an unhoused person(s)." Among other demands, activists also asked that she defund the Oakland Police Department by 50 percent and redirect the funds to help provide permanent housing for homeless individuals across the city. According to Brooks, activists plan to be outside the Mayor's house until 1 a.m.